Prince Genji mourns Yugao in the recently uncovered Moriyasu Bon handscroll. Source. 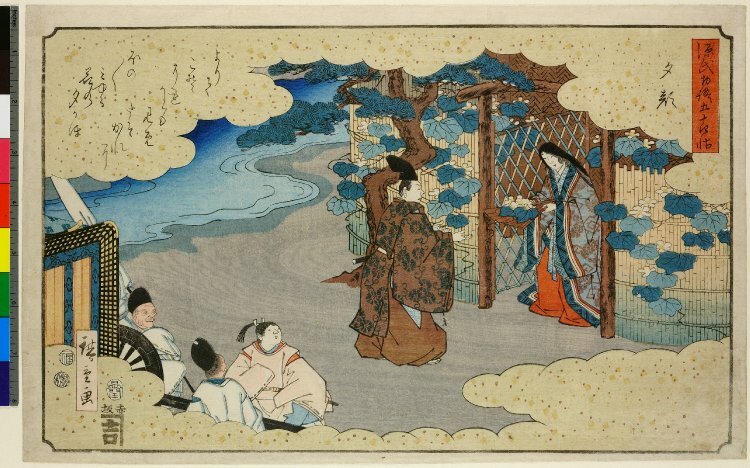 The Metropolitan Museum in New York will have an exhibition of art associated with The Tale of Genji until June 16. Source. This Google doodle for November 1, 2008 commemorated the thousandth anniversary of The Tale of Genji. Kikou Yamata (1897-1975) was a French-Japanese novelist and journalist, who produced the first French translation of The Tale of Genji in 1928. This portrait is by Tsuguharu Foujita (1886-1968), the French-Japanese painter. Source. See her bibliography here. Murasaki Shikibu as Fidelity, by Suzuki Harunobu from the series Five Cardinal Virtues, c. 1767. Minoru Miki's opera The Tale of Genji premiered in St Louis in the year 2000. Review. Yūki Amami of the Takarazuka Revue played Prince Genji in the 2001 film version, Sennen no Koi: Hikaru Genji Monogatari. Sakaki by Ogata Gekko (1892).